LED high bay lighting has become a feasible option for warehouses and manufacturing facilities due to technological advances that provide long-lasting light and cost-saving advantages. With the Energy Information Association’s estimate of more than 10 billion square feet of warehouse space in the United States, that’s a lot of space to equip with high bay lighting. Thousands of warehouses in the United States have already installed LED lighting, and adoption continues to grow due to recent drops in fixture pricing and technology improvements. Both reduced pricing and technology improvements lead to savings that can add up to a short ROI. Shop for LED Fixtures. High, hard-to-reach ceilings, expansive spaces, hot or cold temperatures, long operating hours and unique building characteristics can create lighting challenges and inefficiencies. That’s why so many industrial facility managers turn to lighting-spot.com for customized LED lighting solutions that maximize savings and improve performance throughout their facilities. LED Tubes - Office, Home, Warehouse & More. LED Tubes are the fast and easy way to upgrade to LED. Linear Fluorescent lighting is the most prevalent light source in among Commercial and Industrial buildings and are Ideal one-for-one replacement of conventional lighting systems. LED Tube conversions are the perfect fit for any industry. Shop LED Tubes. LED replacement lamps for HID often referred to as Corn Lights because of the way the LED chips are lined up leverage the low energy and long life of LED. The LED lamp screws into the existing fixture without wiring or costly upgrades. 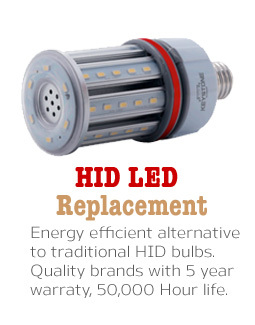 hese lamps are energy efficient and are compliant with material restriction requirements of RoHS and offer worry-free use and disposal. These LED Corn lights typically last a minimum of 50,000 hours, come with a 5 year replacement warranty, replace all HID lamps from 35 watt all the way up to 1500 watt metal halide. They range in colors from 3000K to 5500K, are open fixture rated, have instant On/Brightness, Universal burning postions and offer extremely quick return on investments, as quick as 8 months. Shop for LED Corn Lights.